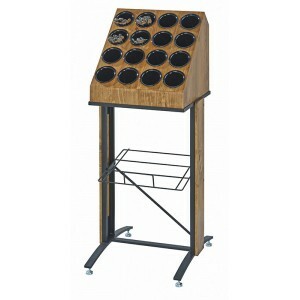 Madera Floorstanding Bulk Condiment Unit - Cal-Mil Plastic Products Inc. This Black Frame for the 16 Cylinder Display is every bit as smooth and subtle as it is durable and practical. Use in tandem with 3423-16-99 for a full-service unit that can hold serving trays, condiments, and flatware in bulk to handle any rush! Base and Cylinder Holder are sold separately.